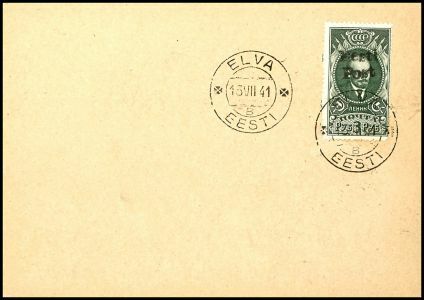 3 Rouble "Lenin" with Hand stamp-excess pressure "Eesti post" in type II, neat cancelled "Elva Eesti B 13. VII. 41" on blanco card, issued only 80 copies, signed Nemvalz and photo expertize Nagler VP (2017) : "genuine and immaculate", Michel 2.200.- - very rare stamp! For lots of the clearance sale we accept underbids up to 30% starting price - if there is no higher bid!